One of the most influential combat shooting books ever published, Shooting to Live is the product of Capt. W.E. Fairbairn's and Capt. E.A. 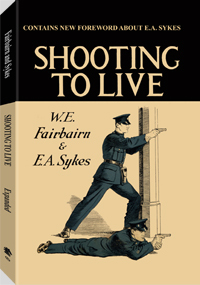 Sykes' practical experience with the handgun from their many close-quarters gunfights while working for the Shanghai Municipal Police in the 1930s. This expanded edition contains a new foreword by British World War II combatives expert Phil Mathews, which sheds new light on the career of E.A. Sykes – the "forgotten hero" of the Fairbairn-Sykes duo – as well as previously unpublished photos. Hundreds of actual incidents provided the basis for Shooting to Live, the first true instruction manual on life-or-death shootouts with the pistol. In clear, concise terms, the book teaches the concepts, considerations and applications of combat pistolcraft. A foreword by Col. Rex Applegate explains how Fairbairn and Sykes introduced their groundbreaking methods into American military training circles at the height of World War II. Captain W.E. Fairbairn taught unarmed combat to the famed British Commandos and the U.S. armed forces during World War II. Before the war he served as assistant commissioner of the Shanghai Police Force. He was the inventor of the Fairbairn Commando Knife and the author of the classics Get Tough, Defendu and Scientific Self Defense.